Table 'FactTransaction_ColumnStore'. Scan count 0, logical reads 0, physical reads 0, read-ahead reads 0, lob logical reads 0, lob physical reads 0, lob read-ahead reads 0. Table 'FactTransaction'. Scan count 1, logical reads 73462, physical reads 0, read-ahead reads 0, lob logical reads 0, lob physical reads 0, lob read-ahead reads 0. SQL Server Execution Times:  CPU time = 98204 ms,  elapsed time = 109927 ms.
Table ' FactTransaction_RowStore '. Scan count 0, logical reads 98566047, physical reads 0, read-ahead reads 0, lob logical reads 0, lob physical reads 0, lob read-ahead reads 0. SQL Server Execution Times:  CPU time = 111375 ms,  elapsed time = 129609 ms.
Table 'FactTransaction_RowStore'. Scan count 0, logical reads 3, physical reads 0, read-ahead reads 0, lob logical reads 0, lob physical reads 0, lob read-ahead reads 0. 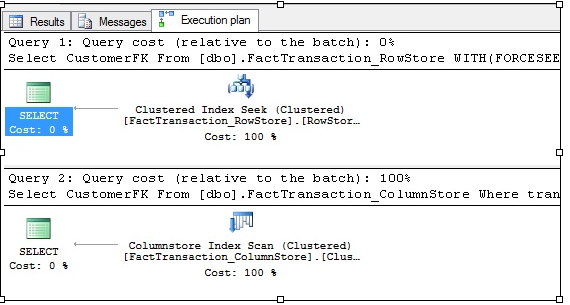 SQL Server Execution Times:    CPU time = 0 ms,  elapsed time = 0 ms.
Table 'FactTransaction_ColumnStore'. Scan count 1, logical reads 714, physical reads 0, read-ahead reads 2510, lob logical reads 0, lob physical reads 0, lob read-ahead reads 0. SQL Server Execution Times:    CPU time = 0 ms,  elapsed time = 83 ms.
Table 'FactTransaction_RowStore'. Scan count 1, logical reads 12704, physical reads 0, read-ahead reads 0, lob logical reads 0, lob physical reads 0, lob read-ahead reads 0. CPU time = 32 ms,  elapsed time = 22 ms.
Table 'FactTransaction_ColumnStore'. Scan count 1, logical reads 714, physical reads 0, read-ahead reads 0, lob logical reads 0, lob physical reads 0, lob read-ahead reads 0. 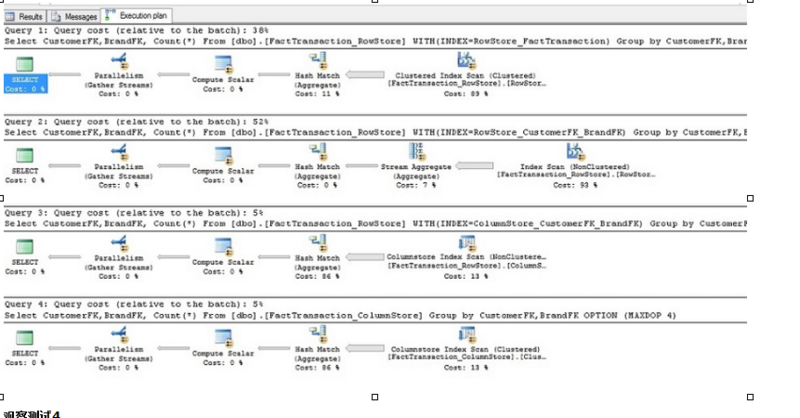 Test on the columnstore table using the Clustered Index. Table 'FactTransaction_RowStore'. Scan count 5, logical reads 45977, physical reads 0, read-ahead reads 0, lob logical reads 0, lob physical reads 0, lob read-ahead reads 0. SQL Server Execution Times:  CPU time = 9516 ms,  elapsed time = 2645 ms.
Table 'FactTransaction_RowStore'. Scan count 5, logical reads 71204, physical reads 0, read-ahead reads 2160, lob logical reads 0, lob physical reads 0, lob read-ahead reads 0. SQL Server Execution Times:  CPU time = 5343 ms,  elapsed time = 1833 ms.
Table 'FactTransaction_RowStore'. Scan count 4, logical reads 785, physical reads 7, read-ahead reads 0, lob logical reads 0, lob physical reads 0, lob read-ahead reads 0. SQL Server Execution Times:  CPU time = 141 ms,  elapsed time = 63 ms.
Table 'FactTransaction_ColumnStore'. Scan count 4, logical reads 723, physical reads 0, read-ahead reads 0, lob logical reads 0, lob physical reads 0, lob read-ahead reads 0. SQL Server Execution Times:  CPU time = 203 ms,  elapsed time = 118 ms.
Table 'FactTransaction_ColumnStore'. Scan count 2, logical reads 2020, physical reads 0, read-ahead reads 2598, lob logical reads 0, lob physical reads 0, lob read-ahead reads 0. SQL Server Execution Times:  CPU time = 27688 ms,  elapsed time = 37638 ms.
Table 'FactTransaction_RowStore'. Scan count 1, logical reads 2800296, physical reads 0, read-ahead reads 0, lob logical reads 0, lob physical reads 0, lob read-ahead reads 0. SQL Server Execution Times:  CPU time = 6812 ms,  elapsed time = 6819 ms.